OLPC XO and Intel Classmate PC! Wow, look what can happen when you're offline a day flying home from Lebanon via Frankfurt: Intel Corporation agreed to join One Laptop Per Child's Board of Directors as the 11th member, focused on exploring collaborations involving technology and educational content. First off, I am not surprised at the move. Last month I was surprised by a call from the OLPC leadership looking for contacts at Intel they could talk with about ending the public feud between Nicholas Negroponte and Craig Barrett. I was asked to keep the call quiet, and I did, for I think overall, the very over-hyped squabble was distracting for everyone involved with low-cost computing for the developing world. But the direction of that call, OLPC looking for Intel contacts, colors my impression of the Intel + OLPC agreement. I don't see Intel joining the OLPC Board as The Register does, Negroponte didn't shame Intel to do anything, but Ashlee Vance was right in downplaying Intel's excitement over working with OLPC. Intel + OLPC was a move of convenience for Intel, but desperation for OLPC, and Intel's direct involvement will degrade OLPC's independence and reduce its impact on computing in the developing world. It's now July and OLPC has yet to announce a bona-fide order contract from any single government. In fact, I've only found one relevant Request for Proposal for one-to-one computers in education and Quanta is even lowering 2007 production projections. All that may not be related to the Negroponte/Barrett flame war, but it was OLPC who was loosing the conversation at the governmental level. Does Leo Prieto prefer OLPC? In my travels for my day-job, I meet often with technology leaders in the developing world, and all of them have heard of both the XO and the Classmate. Opinions on the better hardware platform are mixed, but almost all agree that OLPC's lack of a detailed implementation plan is a deal breaker. 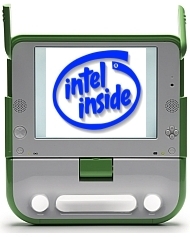 In addition, even when the OLPC XO was clearly understood to be a computing revolution, not a Classmate evolution, Intel's Teach for the Future/World Ahead teacher-centric training program, a decent implementation methodology in its own right, was considered to be world-class and worth an investment in Classmates instead of XO's. Now a marriage of the XO technology with the Intel methodology would be the best outcome of the Intel + OLPC union. My dream of stunning clock-stopping hot technology integrated into classrooms via motivated and trained teachers, and culturally accepted into the larger community as a tool for child-centric learning at home, via the billions of dollars and millions of contacts Intel has developed over its lifetime of close interaction with "emerging markets." Children's Machines flowing through those connections with local computer assemblers, who could then offer XO maintenance plans to schools, freeing teachers to teach, not tech support when children hack source code and Humpty Dumpty laptops. When an 800-pound gorilla gets on a boat, it's going to tilt," Felsenstein said. "Intel will have more opportunity to change things on the inside, and AMD could potentially be the big loser." Ultimately, Intel's motivations will have a large impact on the outcome, he added. "How this goes will depend a lot on Intel's willingness to invest in a new market," he explained. "Will they invest in it, or will they simply be there to spoil AMD's chances? It should be interesting to see." At some point, Intel also wants its chips to be inside the XO laptop, Swope said. "We are going to try to win the XO business, but it's the OLPC's decision. We haven't won the business as a result of this agreement." "There are an awful lot of educational scenarios between K and 12," said William Swope, Intel's director of corporate affairs. "We don't think all those are going to be served by any one form factor, by any one technology, by any one product." Intel did not get to be a multi-billion dollar multinational computing dominator by playing for second in a target (or emerging) market. Intel will invest in OLPC to become the main chip supplier for developing world computers, squashing any other entrant or competition, and not always with better technology. And that may be the worst result of the Intel + OLPC agreement, a decrease in technology competition. For the last six months, as OLPC and Intel battled over participating countries, each company improved its offering. Intel teamed up with Asus to introduce the Eee PC while OLPC dropped Constructionism and focused on educational content and activities. With this competitive pressure removed, neither organization will be pushed to innovate specifically for the developing world's educational market. Oh you and I will definitely see commercial innovation, but that's not the point of one laptop per child (nor is eliminating poverty). OLPC is about education, about empowering children to learn learning using the most cost-efficient and applicable technology. Let's hope Intel remembers that when it joins AMD at the OLPC Board meetings. "We don't think all those are going to be served by any one form factor, by any one technology, by any one product." As Intel has to optimize its share holder value and not education results it is going to try to introduce the same fast CPU pseudo-innovation cycles as they have been doing it in the first world for years. Intel has no interest in letting a CPU price drop by keeping its design constant over years and use the price decay and economy of scale for lowering its price. Their revenues would diminish. They will try to subtly force their customers to buy new "improved" designs every year in order to keep the price up. The OLPC XO is costing now 175$ and is expected to drop towards $50 by 2010. Intel cannot afford to let that happen. They will try to keep the price at 175$ or even slightly increase it. To achieve that they will use their influence to go back to bloatware in order to make their customers require ever stronger CPUs. Intel could not survive in its present form if OLPC would start a new permanent low cost computing market segment in the developing world not to speak about the first world. This threat to Intel is confirmed by the growing number of companies using Linux-Workstations powering many thin clients (stupid terminals) because these companies do not want to pay a high price anymore for bloatware running on high end hardware for simple office tasks. However, since there is no low cost office computer in the market they are forced to resort to terminals. If that dam of low cost computer breaks then Intel is history. Why? Because the investments in production facilities for the always latest high end CPU's are so mindboggling that even Intel can only afford it if they can sell these CPUs to ALL its customers not just one power user market segment. If they start to produce a low cost CPU for a low cost PC its dropping price and cheaper competition will drive Intel out of the market. Therefore, the chance of Intel's support with teacher education and implementation comes with the risk of entering again Intel's typical upward-spiral of ever higher computing (and electrical) power at a high price level. Laptops, might have cost-effectiveness improved with Intel-provided technical-support. 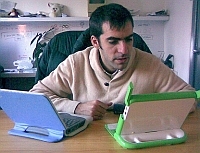 When laptops are used to unify groups of laptops in a small-network, an appliance designed by Intel with power-technology from OLPC could benefit people. Re: wi-max. In some countries it is being licensed, and is not open like the Part 15 (wi-fi) frequencies, so it's benefit will vary from place to place. I'd like to hope that Intel will have a very positive attitude with OLPC going forward. Firstly not to "compete" XO-1 by dumping low volume of Classmate-1. And not dumping EEE-1 in low volumes eigther. Intel should contribute competing with AMD towards the low power CPU for XO-2, there should be an even lower power CPU than LX-700, with DCON, instant-resume and all perticular innovative and extremely usefull technologies of OLPC integrated, which are not integrated in anyway in Classmate-1/EEE-1. LX-700 type of processor could run Windows XP, so there isn't an argument for more power unless it can be made for cheaper and by lower power consumption. Then Intel could provide cheap low power Mobile 802.16e WiMax for XO-2, if they can develop a WiMax Mesh network technology, a low-power WiMax chip that has it's own ultra-low power CPU and memory just as the Marvell WiFi Mesh chip of the XO-1. Then it should be see if WiMax can replace WiFi or if it should be a secondary wireless access to add. Intel has dozens of other things they could contribute, but always keeping in mind the price should decrease towards $50 by 2009. The High-K/Metal Gate Research and Development, the multiple-cores, the built-in graphics acceleration, lots of other things Intel has knowledge and ressources to make, it should be evaluated which of these technologies can be contributed to lowering the cost and lowering the power consumption. I believe there are enough people on this planet for all kinds of computers. There will still be alot of people who need to encode videos faster, play new 3D games, process graphics and animations, those people will continue to need the expensive computers. And then there is an enormous untapped market in the developping and in the western world for people who will need very low cost and very low power consuming computers. It's inevitable now, the upwards spiral in price/power consumption is not applicable any longer. So Intel is welcome to be part of that kind of future, it's gonna be a fun ride, withg low margins and large volumes. "They will try to subtly force their customers to buy new "improved" designs every year in order to keep the price up. The OLPC XO is costing now 175$ and is expected to drop towards $50 by 2010. Intel cannot afford to let that happen. They will try to keep the price at 175$ or even slightly increase it." The PC market has seen a certain "optimal price point". Computers keep kosting roughly the same over the years. You do get more bang for the buck though. You see the same for other markets, like attraction parks. There are two reasons for this. First, people have a certain amount of money to spend on a certain type of product. They will want to get the most for that money. The second is that software has consistently consumed any increase in performance. The famous "What Andy giveth, Bill taketh". Bill Gates seems even to have promised this to hardwaremakers in the 1980s. Vista is nothing special in this respect, except that it consumes processor cycles to control and limit the user (something Intel must not be too happy with). I expect education in the developing world to be not different from other users. Just that the optimal price point will be different. However, I think Intel will be smart enough to see that they can earn more money by getting everybody a computer with some Intel chips than just a minority a computer with only Intel chips. And I think the WiMax point should not be underestimated. Intel has fought very hard to get their WiFi standards accepted internationally (there was even a major diplomatic row with China over this). This would be a really good channel to get the world to use Intel WiFi chips. So would it be "If you can't beat them, join them" or "Keep your friends close, but your enemies closer", or even "The kiss of death"? Is there anyone who has an idea? I know there is a large Classmate project in Pakistan, but that seems to be more about building a factory than actual deployment. Logically, Intel will give up marketing its Classmate and EEE to the third world, other than testing deployments in small quantities. The deal with Pakistan is not to start before 2009, so rather Intel would try and provide the low cost, low power Intel chip for XO-2 to be not only in Pakistan but deployed at the rate of 100 million laptops a year all over the world. It probably was central to this agreement that Intel made a deal with Nicholas Negroponte not to continue the imorral behavious around the Classmate-1 and rather bring their Classmate R&D team to come and help out the OLPC staff do the server right, use WiMax already, implement x86 educationnal software right and start on XO-2, which will need at least 6 months and up to 12 months for testing and betas. And for XO-2, unless one performs really better in terms of low price and low power consumption, then I guess it could also work out that every other laptop have an Intel chip while the other be AMD, as long as they could provide compatible performance so software runs as well on both. Cause if they are to be manufacturing at a rate of 10 million laptops a month, unless one is doing a better product than the other, I guess AMD and Intel could share the manufacturing burden half and half, that would make sence. Maybe there is no need for one to crush the other in terms of making the CPU. I don't think Intel will even think about giving up its Classmate PC nor its Eee PC anytime soon, both are useful sticks to keep OLPC in line until _all_ OLPC products run on Intel chips. Remember, Intel is in this to grain market share, everything else is whitewash to Wall Street. In fact, I see Classmate and Eee filling niches that OLPC will not. Imagine a Eee form factor with OLPC guts - I'd want one! Or Classmate as the Windows option for governments hitched to Microsoft? As much as it may surprise all of us, not everyone will want an XO laptop. EEE is not $200. It's far from that. Probably minimum of $400 and over $500 with Windows XP, then why not get a normal Intel full sized laptop in Wal-Mart for a bit more than that price. You're missing the point if you think Classmate or EEE are cheap. There are no proof at all anywhere on the Internet to backup that they should be cheap. $200 and $225 are just made up number which everyone knew were fake, and that's why Intel has finally agreed to join OLPC because it was getting to be too ridiculous for them to continue playing that game. If Intel can convince OLPC to market a CM-1 in certain markets then fine. But there is simply so many things Classmate nor EEE are not taking into play. The screen, wifi mesh and interface are just some of the aspects. Anyways if Intel wants OLPC to push CM-1 then why not, but it makes 100 times more sence for Intel to contribute towards XO-2. R&D into XO-2 has to start now, and the Intel engineers are welcome to take everything that they want from the XO-1 design and try and improve it for XO-2, which is going to be very important since there will be manufactured 10 times more XO-2 then XO-1 if mass production happens as planned. Ya know Charbax, I'm getting tired of the "Classmate isn't $200" line as you seem to think costs matter in pricing. If you didn't notice, the XO cost is way more than even $175, its development is funded by donations. You also seem to think what Intel does is "immoral" but the only thing immoral would be NOT going after a 1 billion unit market with everything they have, including subsidies. And what makes the most sense to Intel is doing whatever it takes, including pushing Classmate and Eee, until it dominates the OLPC hardware too. You and I can only hope and agree that when it does, it will be with chipset technology that is better than the current AMD Geode. The quicker XO-2 can be made cheaper, with lower power consumption, with a better screen and with WiMax, the quicker it will replace XO-1, so Intel should get going right away contributing towards XO-2, they are a year late into the game, so now is the time for them to improve XO-2 since Intel is so diversified, they have potential to contribute great R&D results to OLPC in every single aspect of the laptop. There is only one flaw in your XO-2 dream: If I am a Minister of Education, why would I want to buy a $176 XO-1 today when I can wait two years (about the time it would take me to get buy-in from stakeholders anyway) and get a better product for way less? And if I am Intel, why would I want the price of chips to drop so quickly so fast? $50 doesn't leave much for chipset spend, now does it? The whole point of OLPC being a nonprofit was to escape the feature creep and focus on making one product, with one feature set, so it could drive down prices mercilessly. If Intel has got a better chip than AMD Geode, then I'd like to know its model name. We're talking about a fanless ultra low power CPU, one that consumes less than 1 Watt, once than can use as little as 200 milliwatts using a DCON system that suspends the whole CPU. I asked the Intel engineer over a year ago at WCIT if they would use the Xscale processor for such a laptop, he said it wasn't the plan. Well I really don't know of a Intel ULV processor that can compare with the AMD Geode, although I am sure Intel has one that must be comparable. Fanless x86, ultra low power consumption, ultra cheap, and such. The only UMPCs I am seeing on the market with fanless CPUs are ones using the Geode LX-700 or LX-900. Is it Intel McCaslin "Stealey" Menlow codename processor that they are developping for the smaller form factor UMPCs, is that the fanless low power Intel CPU that would compare or beat AMD Geode in terms of being fanless, low power and cheap? If that is it, then great, let Intel hurry up and bring a Menlow chip for the XO-2 that beats LX-700. A Minister of Education is only minister of education for so long, he needs to act fast to get results really fast or that government is not re-elected. And children are in very URGENT need of better education. It would be CRIMINAL not to act immediately and buy in any XO as soon as possible. Countries who buy early will be the ones with the best OLPC implementation, potentially they will be able to build years of advance experience compared to other countries who will only join later. Every month that passes without XO laptops, millions of children of the age of around 6 are wasting their precious time without education when they are in urgent need to be educated. 40-200 million $ is a bargain for the price of a million children in one country getting education a year earlier. "Ya know Charbax, I'm getting tired of the "Classmate isn't $200" line as you seem to think costs matter in pricing. If you didn't notice, the XO cost is way more than even $175, its development is funded by donations." Wayan, I think you focus on the wrong problem. Let me phrase that differently. The question is not a moral one, but whether Intel can deliver the "next billion", or even 100 million. As a non-profit, OLPC can write of all the development cost and now produce 10 million laptops for $1.75B, 100 Million laptops for around $10B. And presumably 500 Million laptops for $25-50B. With no loss, or even a profit. My question is, can Intel produce Classmates in these quantities for, respectively, $2B, $20B, and $100B? If the real (marginal) production cost of a CM is $300, ie, 50% up, Intel would incurr losses of $1B, $10B, and $50B. Even at a loss of only $10 per Classmate, Intel would lose $5B producing 500 million laptops. And the marketting phrase is "the next billion". I agree Charbax, Intel does not have a chip like the Geode. Let's hope this agreement with OLPC will get them to make one. But Ministers are not usually elected, they are appointed, and they probably do not feel that waiting for a cheaper/better OLPC XO as "criminal" by any stretch of the imagination. In fact, the only actual criminal act would be spending $ millions in taxpayer money without a careful evaluation of options and due diligence. For that Ministers, and even US government workers, are regularly sent to jail. I had quit the blog a bit because of all the absurd reasoning, only to discover things have gotten much worse in my absence. Why is everyone debating Intel's reasons and not Negroponte's? 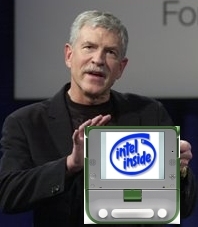 I'll serve a clue to clueless Wayan: the only possible thing of value to Intel is the display technology. I am very aware that Intel wants the screen technology, Intel staff told me that personally back in November of last year. Of course that Jepsen was Intel's screen technology guru just makes it all the more intriguing. But Intel does not sell screens, they sell chips. Screens would be a carrot they could use to expand their chip share (Intel inside and you get dual mode screens). But here's the double intrigue - Jepsen said she gave MIT the patents and Chi Mei is the sole manufacturing licensee for 20 months or 20 million units, whichever comes first. I think they, more than Intel, will want to be fronting dual mode displays to sell exactly 20 million in 20 months - and not one less or one day shorter. As to Negroponte, I think he may have been cornered by both his staff, who didn't see the fight as becoming to OLPC, and governments, who were using the Intel competition to delay committing to OLPC. Either way, I don't think Negroponte is all that happy - where is his quote in the press release? XO-3 $50 for up to 500 million produced by end of 2010Whoever believes Intel is going"
It is just wishful thinking to believe that Intel would help to drop the prices as you listed. Intel not only wants to conquer the computer market in the developing countries but they are forced to. But they will not play the game as you predict it. They have put the Classmate-1 together in a hurry to get their foot in the doors of educational ministers and stall OLPC's launch in order to gain time. This they have successfully achieved. For that the cost of Classmate-1 did not really matter since they are not going to sell it in large numbers. The next move will be a Classmate-2. This will probably cost the same as the XO-1 and will be sold to a similar price than XO-1. So it could be sold in larger numbers without losses for Intel. And it will have more XO-like hardware features but maybe not all of them. And it will use the OLPC software suite. If OLPC is still competing with an XO-2 they would face very stiff competition. But probably OLPC will not even compete anymore but cooperate with Intel on the new Classmate-2. It might even be named XO-2 for camouflage. But it will have "Intel inside". As soon as these 20 months license to ChiMei has expired Intel will launch its Classmate-3 using the dual-mode screens too and already new hardware feature will creep in (maybe the WIMAX but no further power reduction not to speak of further price reduction) in order to keep the price at $200. When that happened Intel is going to win control over the new market. As Will Swope already hinted Intel will then swamp the market with many different models. All with even more features at higher prices. But they will also be very careful that those low cost laptops will not become too attractive products for the 1st world in order not to cut into their own high priced computing market. I am very disappointed. This is quickly turning from an educational step forward into a market commodity. What happened to open-source, Academic, and parent/teacher friendly? How can you create new and original things if you are controlled by the same people that retarded the industry's progress. Education computers in America were progressing until Microsoft declared a pointless war on Apple, Texas Instruments, and Commodore. 1. Parents want a kids-only operating system for the kids' safety. 2. Teachers want open software/hardware, so people can be really creative about class projects. I want to be 7 years old and getting my OLPC. I believe there is still the opportunity for OLPC to stay independent if they consequently follow their low price, low power, low bloatware and open source strategy for the next years. And use their patents as a defense. Intel could not keep competing with that. But first OLPC must have a successful launch. To achieve that probably means providing test results and an implementation plan with e.g. teacher education and localized content. Of course OLPC has not the resources to do that. But maybe the target countries could buy this from different sources. Content could be covered by local communities. And implementation and training by a local contractor or the ministries of education themselves. "They will try to keep the price at 175$ or even slightly increase it. To achieve that they will use their influence to go back to bloatware in order to make their customers require ever stronger CPUs." "I think Intel will be smart enough to see that they can earn more money by getting everybody a computer with some Intel chips than just a minority a computer with only Intel chips. " I am with winter on this one. Think of the cell phone market. Here in the US they keep prices high by adding more features and bloat. But in the developing world most people buy $20 phones because that is what they can afford, so that is what the oem's produce and sell. And those $20 cell phones are as functional as $500 ones from a decade ago. Moore's law cuts both ways, depending on what the market can afford. In the case of oplc, a new computer has been invented that poor people can afford. If Intel doesn't make chips for that market, someone else will. I think a lot of people are confusing Intel with Microsoft. Microsoft can crush competition and keep prices high because with operating systems there is a very strong lock-in factor. It started out by selling a cheap os, then once everyone was locked in it could control the market, lock out competitors, and sell over-priced bloatware. People look at how Intel is the dominant producer in the cpu market, and think it has the same ability to control the market and force eveyone to buy over-powered chips. But the cpu market is actually very competitive. That is because there is no lock-in. Anyone is free to produce x86 compatible chips, so Intel has no real ability to lock out competitors. That is why I say if it doesn't produce chips for laptops that potential oplc customers could afford, someone else will. Oplc has opened up a vast new market, and that means there is going to be competition, which can be only good for all those hundreds of millions of people who previously could not afford a computer. "That is because there is no lock-in. Anyone is free to produce x86 compatible chips, so Intel has no real ability to lock out competitors." Sorry, this is not completely true. AMD got its license to produce X86 chips from the initial PC contract with IBM. IBM would have refused to buy from Intel without a second supplier (if they only had done that with Dos). So AMD got a license. Several other chip makers were able to produce x86 chips from other (sub-)contracts. But on the whole, Intel owns the copyrights on the x86 instruction set and microcode (whatever such a copyright means). There are ways around that, as Transmeta showed. But you are right, Intel does have a near monopoly, but not enough lock in to really have the power of MS. On the other hand, the AMD-Intel anti trust suits have shown how devious Intel can operate. If OLPC wants to help nations to develop, then they should chose suppliers from "3rd world" nations. Giving big contracts to companies in those nations can help them to help themselves. 1st world companies like Intel have made enough money and already have a customer base. It would never help American workers either, because Intel uses foreign labor, instead of its own western people, because foreignors are easier to exploit. What Americans really want are factories located in America. An American factory making things for Asia, Indian, or even Africa is what the average person on the street here would like to do. If Americans could make a car or airplane that Africans could afford and use, believe me, they would do it. People like Intel exploiting other populations to get around work safety and envronmental laws has caused misery in both countries. The 3rd world workers hate the exploitation, and American workers hate being ignored just because they are harder to exploit. Asia and India have electrical engineers; they can design CPUs. Software engineers are in many non-western nations; they can make software and even operating systems. If they really need 1st world expertise, "fabless", companies like Marvel Semiconductor can sell them blueprints. Q: How will OLPC work with Intel® technology? A: Initially, OLPC is planning to add Intel® Xeon® processor based servers to their product offerings, taking advantage of world class performance, reliability and energy efficiency. In addition, Intel is developing a system board design for OLPC consideration in their next generation XO device. We are also beginning to explore more wide ranging technology and product collaboration that will bring exciting new technology innovations to children around the world.